I love craft books! They give me so many great ideas. Recently, while shopping at HM Ben Franklin Crafts, I discovered a bonanza of really terrific craft books. 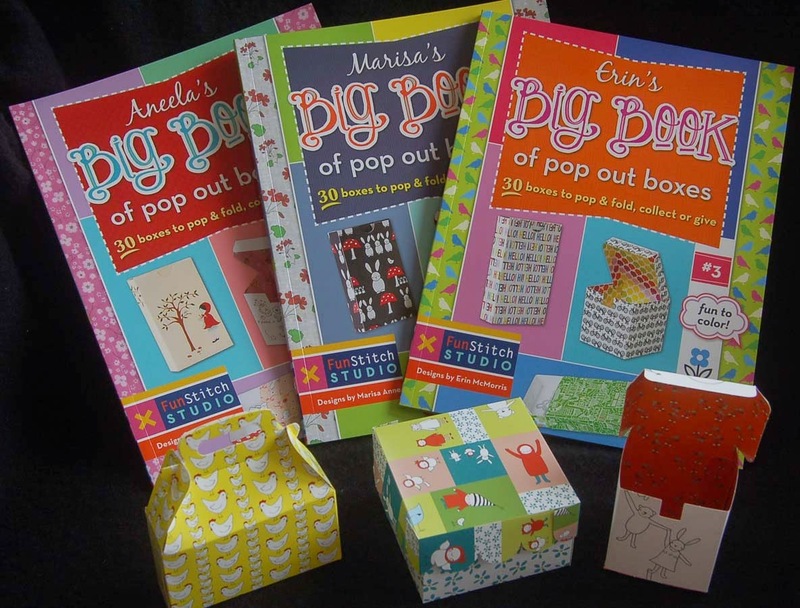 If you have a passion for putting little gifts in little boxes you will love these three books. Each one contains a variety of 30 easily popped out boxes that fold simply and are printed inside and out. (You can even color the black and white designs if you desire.) I know that you will love this series of books because they are an economical source of boxes that can remain flattened for storage until you need them. When I read craft books, I tab them with Post-Its to mark ideas that I want to come back to read again. As you can tell these three books had lots of super ideas and recipes (for soap). (Some of the tabs are folded behind the book on interactive cards.) I really enjoy making cards that the recipient can play with....I'm such a kid....and this soft cover book has some card styles that I haven't encountered before. I've been a long-time soap maker so I really didn't need another book of how-to and recipes, but some of the soaps shown in this book were so luscious I had to get the recipes for mint chocolate, lavender clay, cafe latte, lemon poppy seed muffin and more. With all the chalkboard crafting supplies at BFC this DIY book was of real interest to me. 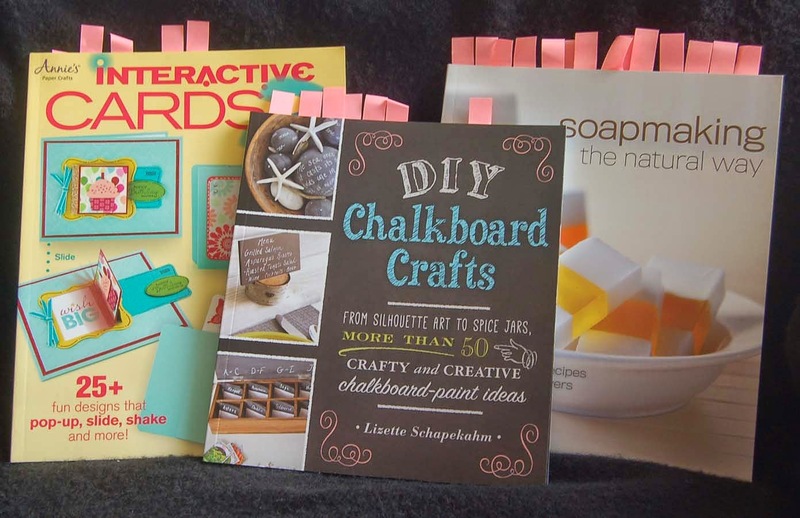 In it I found a wealth of unique, useful craft ideas for organizers, lunchboxes, and decorative objects that incorporate chalkboard paint, paper or stickers. These last two books are real beauties. Washi tape is so popular, inexpensive, and fun that it seemed natural that someone would make a book like this. 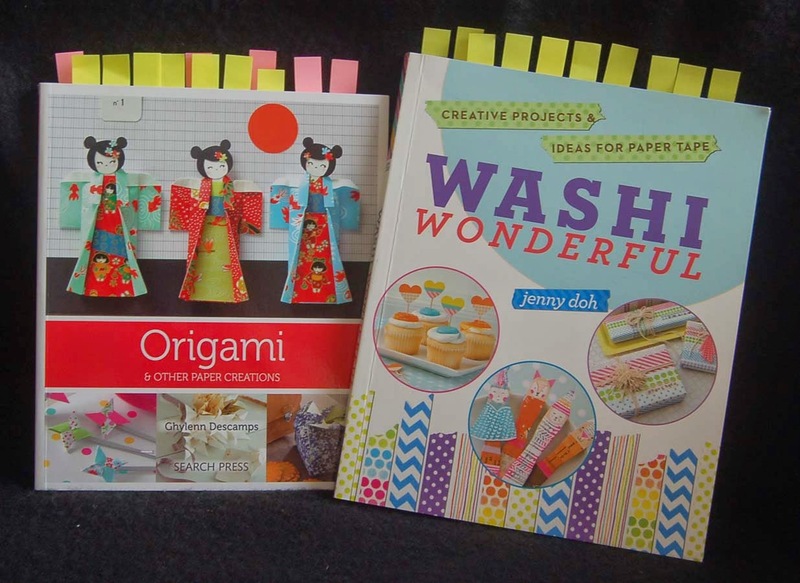 The author, Jenny Doh, is really clever and has created some cute and appealing washi crafts...love the gift wrapping ideas, decorated light switches, and up-cycled containers. The final book that I eagerly picked up at BFC was one on origami. I have many, many, MANY! origami folding books (my son also loved making folded paper items) so I certainly didn't NEED another one.....oh but this one is so beautiful....and I haven't seen some of the folded objects before...really! Notice how many tabs I put in this book! I definitely plan to make some of the office organizers....beautiful and useful....and made from paper. I hope that you will take some time to browse through the HM Ben Franklin Crafts craft book 'library'. I know you will find a book with a new idea or technique to enhance your crafting skills. Reading and creating are good for your brain and your soul. Tea Tin Recycled into.......Tea Tin? Yes, you read this post title correctly......I turned a used tea tin into a new tea tin! 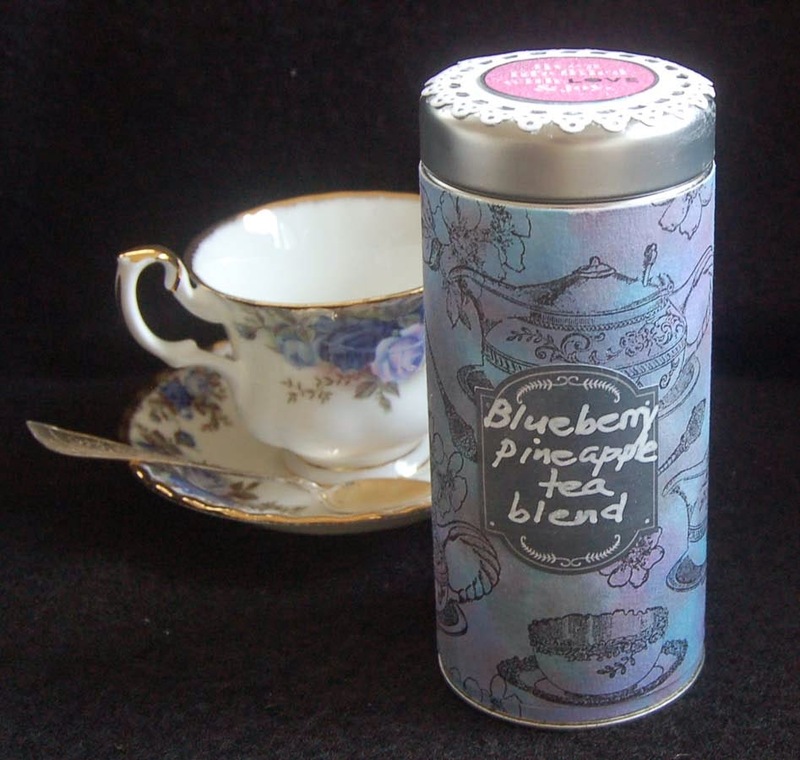 Soon after I finished a tin of strawberry cream tea (Coffee Bean and Tea Leaf ), I purchase some Teavana blueberry pineapple blended loose tea. The tea is sold in a bag by weight which is a little inconvenient for easy access. Since I saved the tea tin (couldn't throw away such a good container) using my craft supplies to redesign it for the blueberry pineapple tea was a no-brainer. I started by peeling off as much of the label from the old tin as I could. (A little acetone a.k.a. nail polish remover aids in removing sticky residue.) Next I applied distress inks (Tim Holtz) to a piece of watercolor paper that ws sprayed with water and taped to my work surface (to keep the paper from warping). After the paper was dry, I stamped the tea time images with Memento black ink. I adhered the trimmed, stamped paper to the tin with Merikan tape. To the top of the tin I glued (Beacon 3 in 1) a Martha Stewart doily tag and added a Mambi chalkboard sticker. The bottom of the tin was decorated with a punched cardstock circle and Mambi stickers too. The blackboard stickers are perfect for this project because they can be written on with chalk or chalkboard markers (Marvy Uchida) erased and re-written when you change out the tea. 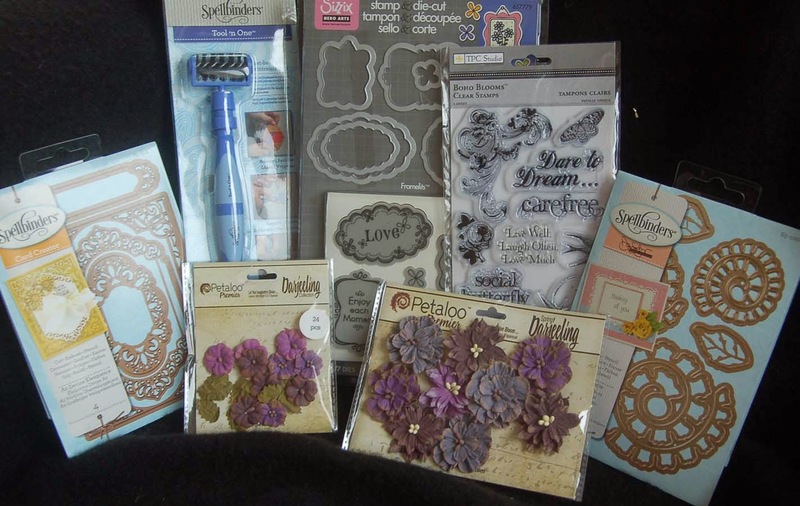 All of the decorating products were purchased at HM Ben Franklin Crafts. 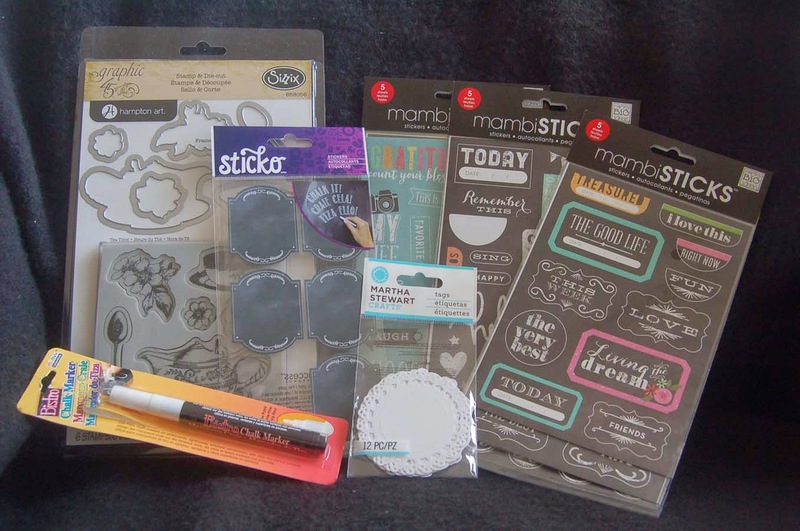 The Mambi stickers were my favorite new purchase because each package has 5 sheets but cost under $6 so they are a real bargain! The BFC stores also have a line of Sticko blackboard labels which are sold by the single sheet for around $2. 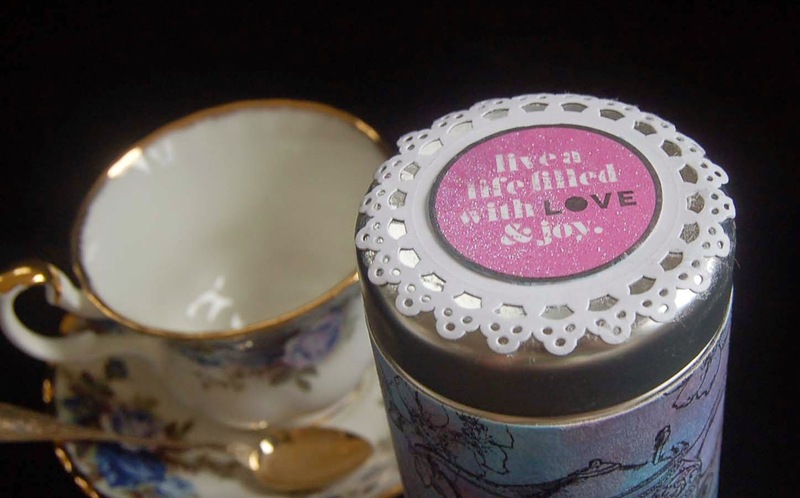 The Sizzix tea time set has a very vintage romantic look and also comes with matching dies. 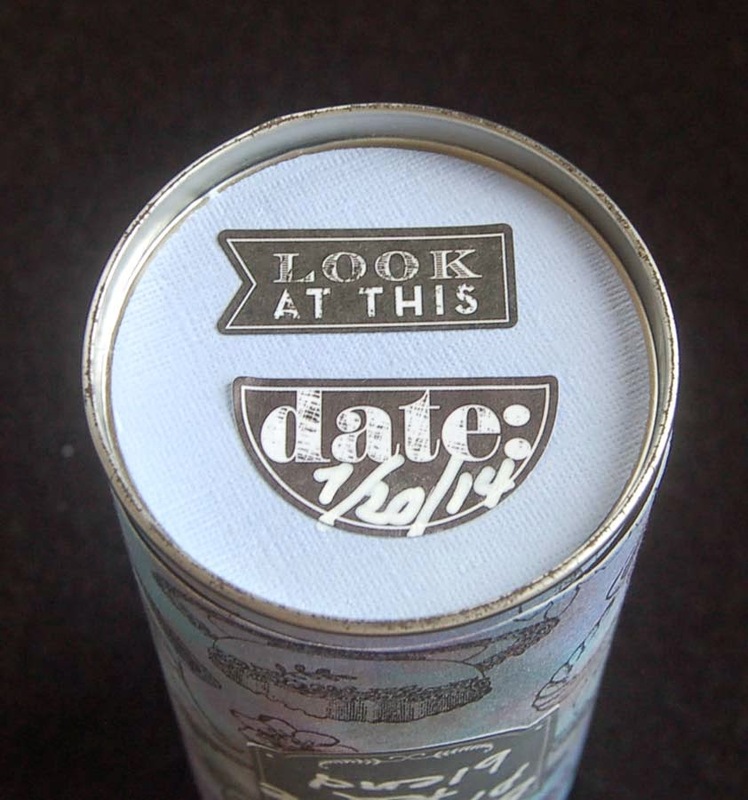 I think for the next tin I recycle I will put a die cut teapot image on the top. Thanks for reading this post and now it is time for a tea break. Mmmmm! I need some scones. Usually I make humorous cards for my husband, but for our anniversary this year I decided to surprise him and create a romantic card. The Spellbinder dies I purchased recently from HM Ben Franklin Crafts were perfect for this purpose. 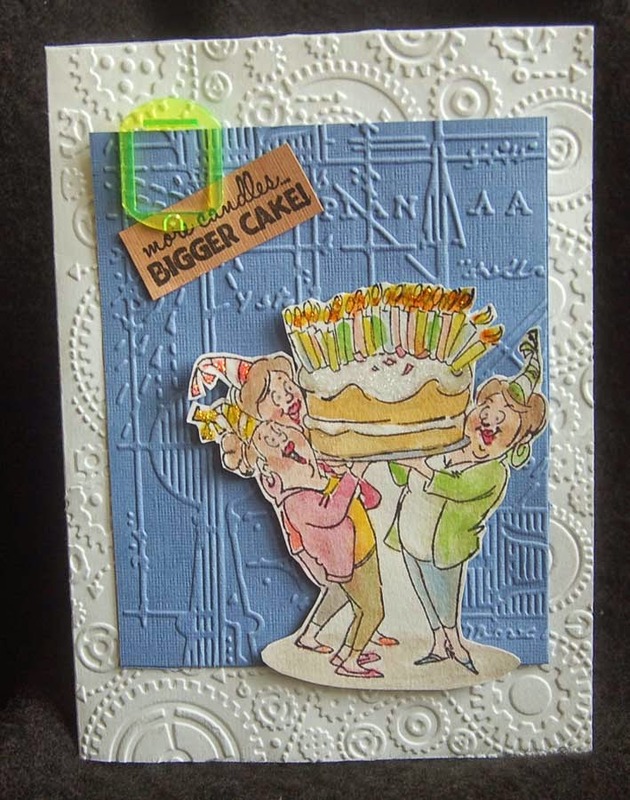 I could have stamped and heat embossed the sentiment right on the card but after die cutting the intricate design I decided not to take a chance of stamping a poor image. 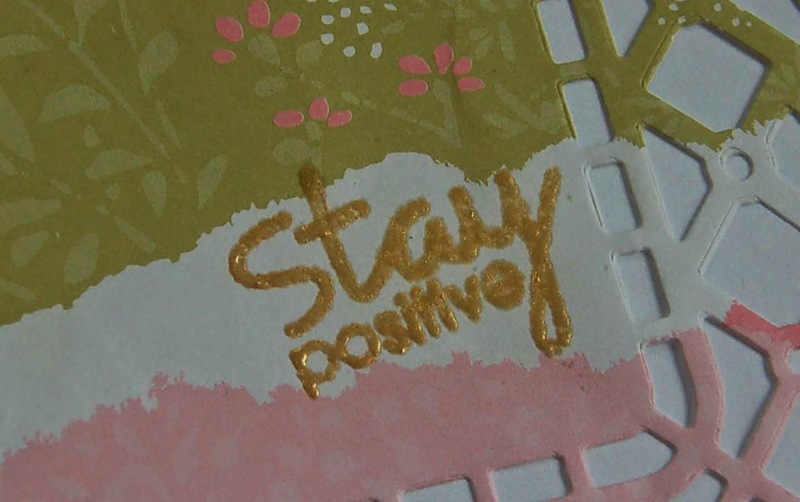 I stamped the TPC sentiment on a paper cut with a Sizzix die. I used gold ink and embossing powder even on the edges of the die cut label. Since my sister is celebrating her anniversary a few days after mine and I had all my supplies out, I decided to make her a card too. For hers I chose more feminine colors (not sure if the colors used for my husband card were both romantic and masculine LOL!). I think the colors of this card work better together than the first one. I just love the intricate cuts of the Spellbinders dies and don't even mind that it took several passed through my Big Shot to get a clean die cut because it is so romantically vintage. 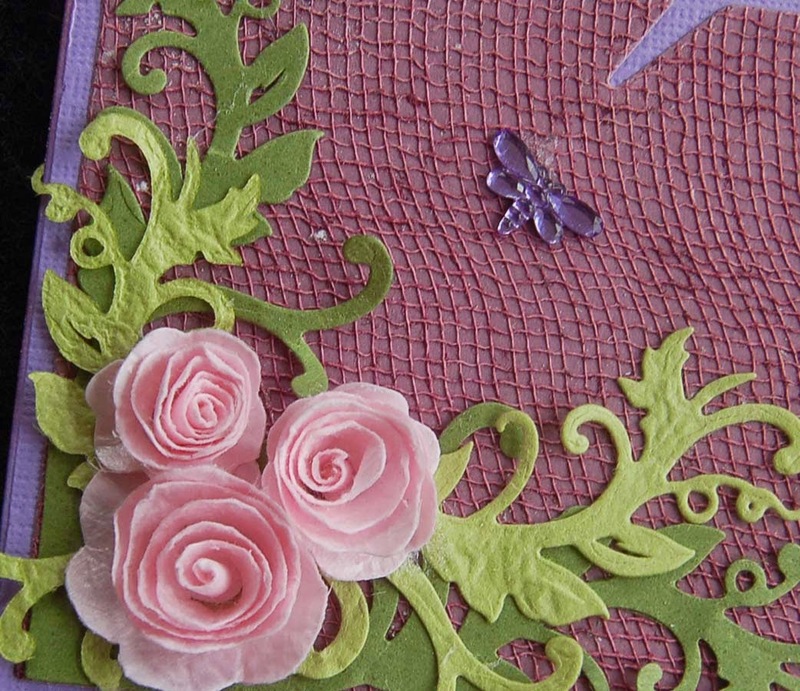 Here is a close-up of the roses and leaves I made using the Spellbinders die set. This is a fabulous set because not only does it make gorgeous roses in three sizes but there are also dies for leaves that emboss the veins. Love this die set! 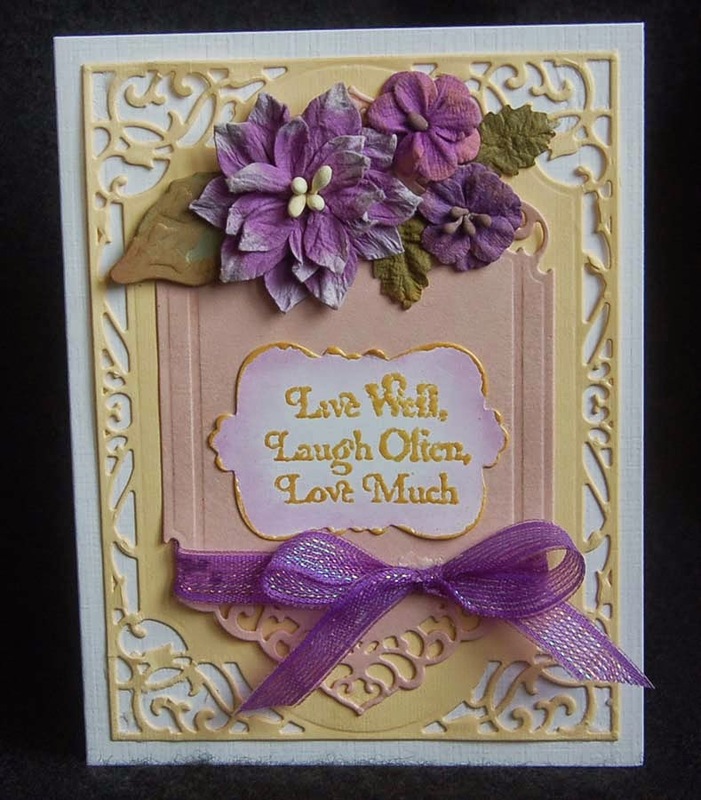 For my sister's card I used the Petaloo flowers (from Ben Franklin Crafts) because they are flatter for mailing. The new Petaloo flowers at the store are so gorgeous and really add the vintage, romantic look I love....sort of shabby, chic.....like us....LOL! Oh yes, I almost forgot to mention that I found a new tool at Ben Franklin Crafts. This Spellbinders tool has a rolling brush and two other tips that help to clean out the chads (little bits of punched out paper) from the dies after cutting. It is very effective and time-saving. Thanks for stopping by to see what I've been creating and please leave a comment or ask a question if you desire. I love hearing from you. Create a crafty world! 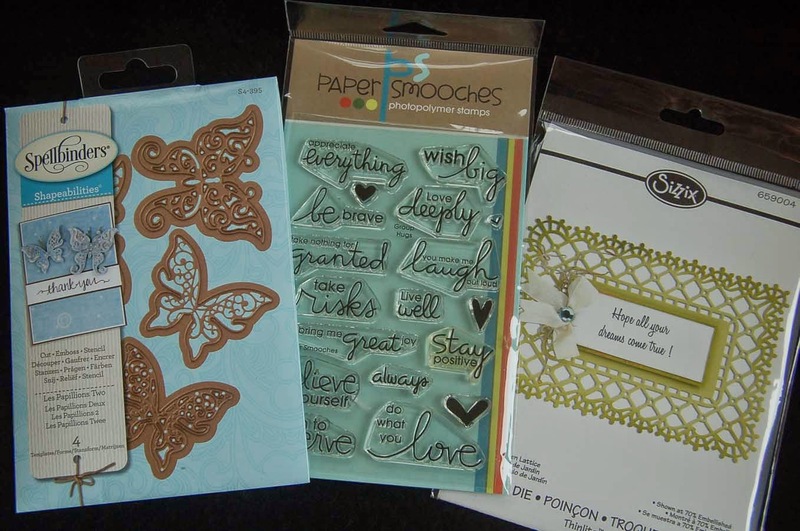 I purchased a set of Tim Holtz Sizzix embossing folders awhile ago because I love the Steampunk look, but until now I didn't have a use for them. My girlfriend, who is an engineer, is having a birthday and I thought that the embossing folders would provide the perfect background for her birthday card. Together with the Art Impressions image and sentiment I think the resulting card will please her. 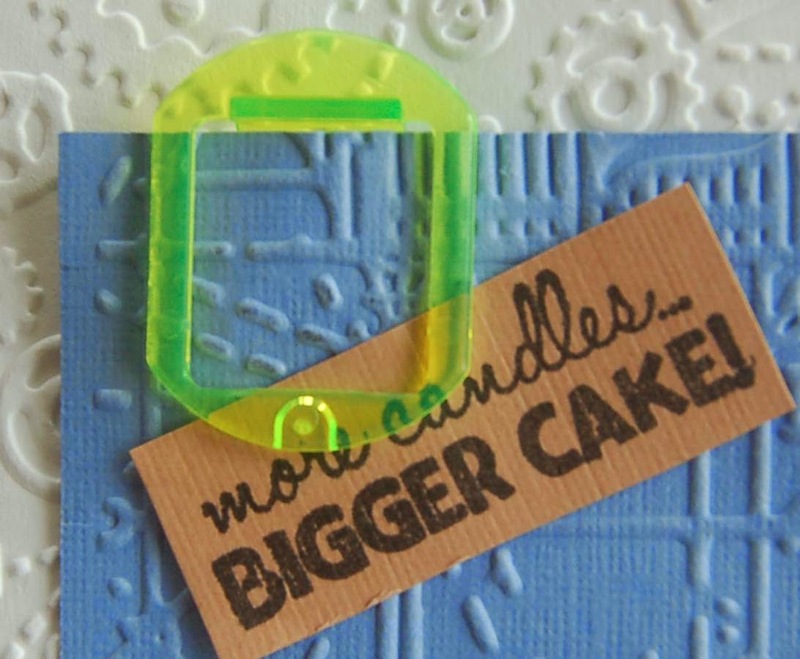 Here a close-up of the neon clip I used to attach the sentiment to the card. Actually I was looking for a regular paper clip (Can you believe it I couldn't find even one?) but I discovered a whole box of fancy ones in the back of my junk drawer. I think I bought them from an office supply store and to me it adds just the right pop of color and high-tech look. 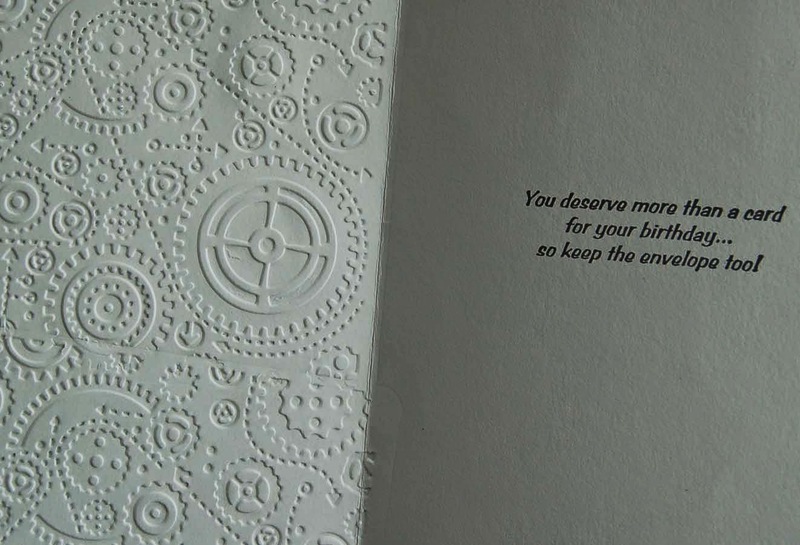 Because I embossed the left side of the card blank, the inside looks cool too. The sentiment inside is rubber stamped (Viva Las Vegas stamp?) because my friend and I don't exchange gifts but I wanted her to know I remembered her birthday in a humorous way. To color the AI image I used the Reeves watercolor 12 color pocket set available at HM Ben Franklin Crafts. I loved the color selection and the ability to mix the colors to just the right shade, however for an image with such fine detail I would probably use watercolor pencils and a water filled pen instead. What I do think is a plus for this watercolor set is that it has blending compartments on the lid and a fairly good brush is included which makes it very portable. Okay that's all for this post. 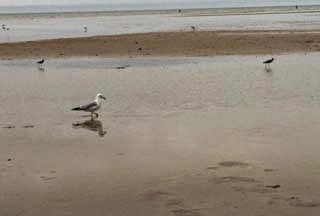 I hope that you enjoyed your visit to this blog site and that you will return often. Have a crafty life! I've been doing a little playing with my new tools and supplies. I eagerly opened the quilled rose dies and tested them out on a variety of papers. I discovered they work best on thin paper, preferably not fibrous. 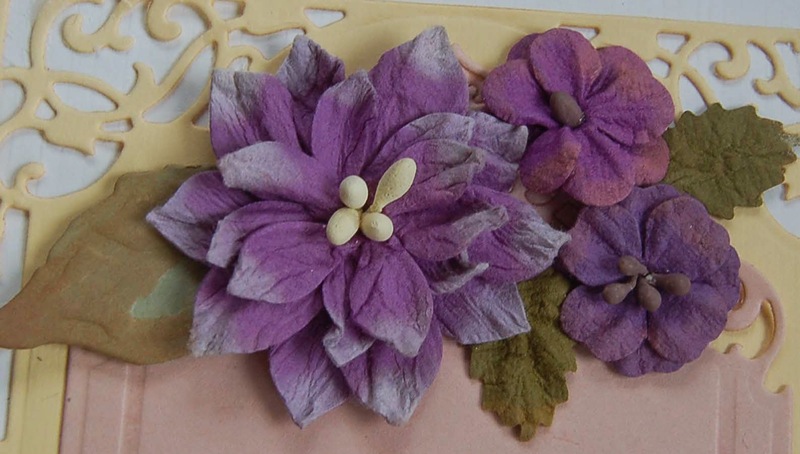 Crinkled Japanese paper makes very pretty flowers if you can find some. Because the paper that I chose was a little soft the quilling tool did not grab it so I simply wet the end and wound it around the tool. 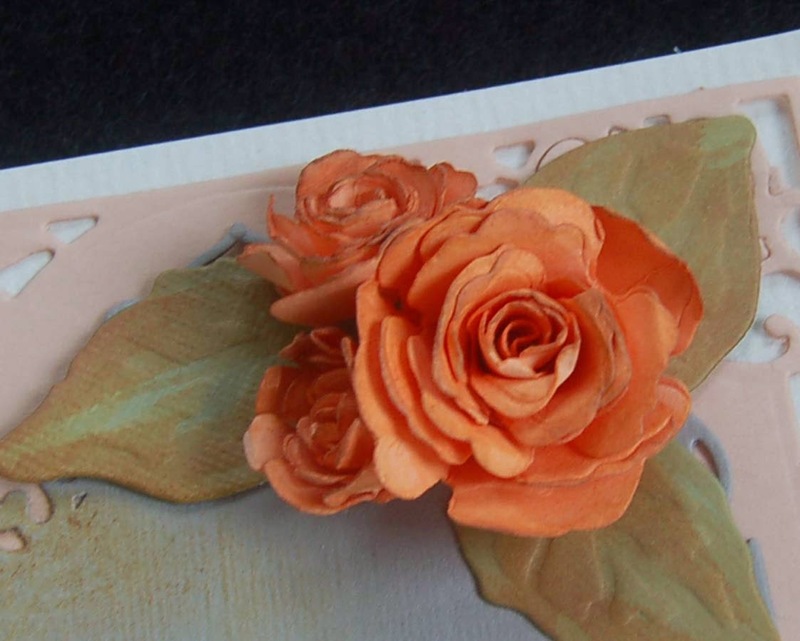 It worked well and made very dainty roses at a fraction of the cost of pre-made paper flowers. I was also eager to bust open the 6 x 6 pack of gauze papers I purchased from Ben Franklin Crafts. 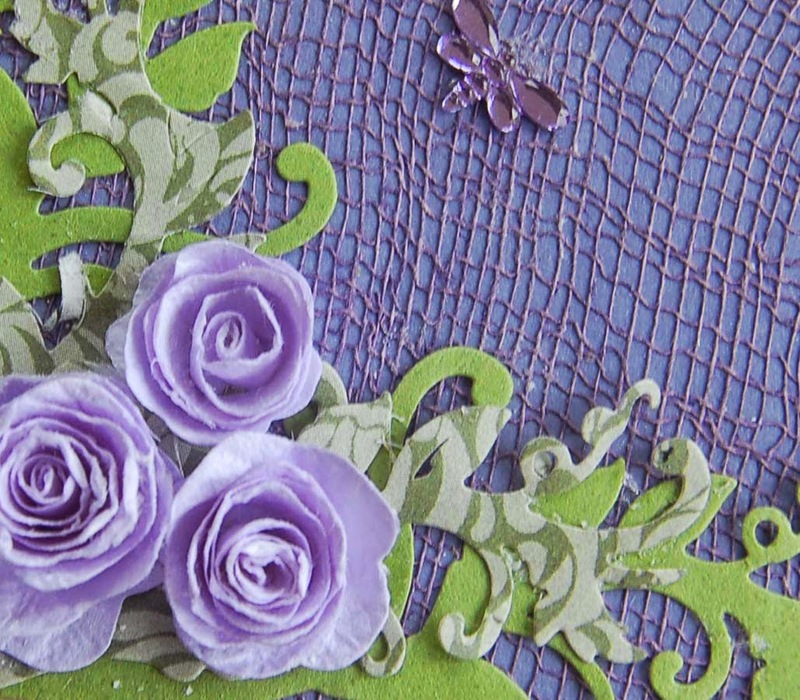 The Paper Smooches die cut very well through the gauze paper despite the netted texture. 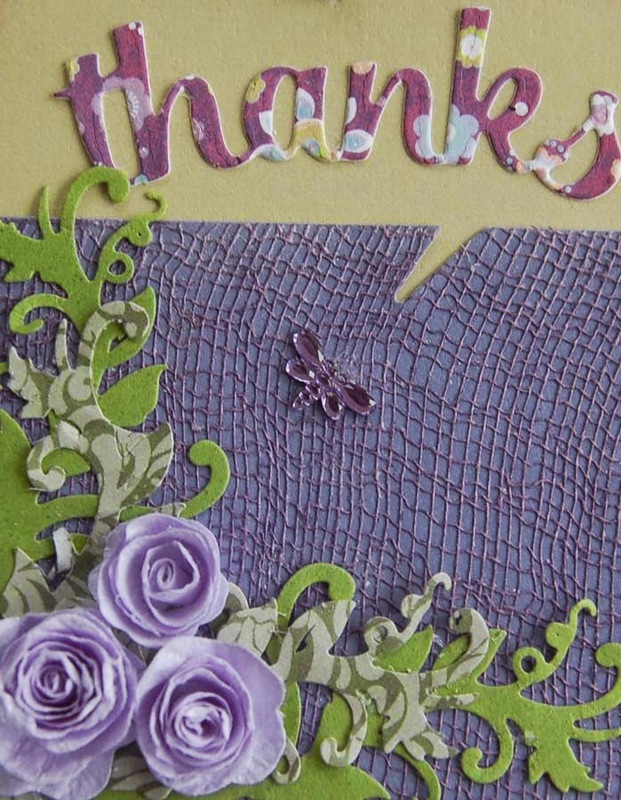 I used the Paper Smooches quote tag die set which is one of my favorites because it has the words 'thanks' and 'hello' in a very nice script. 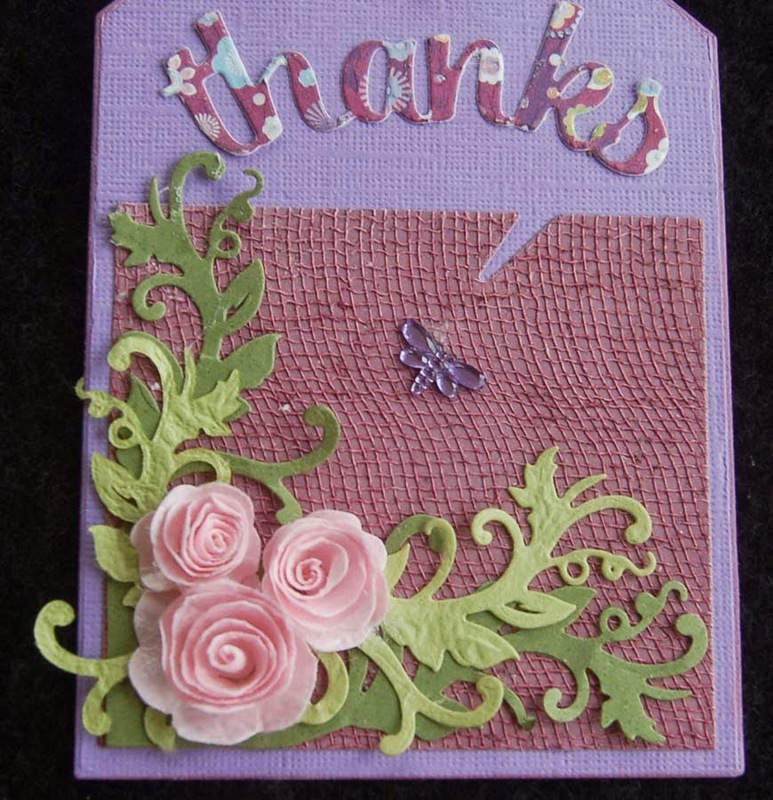 At first I did not include the dragonfly acrylic sticker but realized that something should be 'saying ' the thanks. The dragonfly seemed like a great solution. 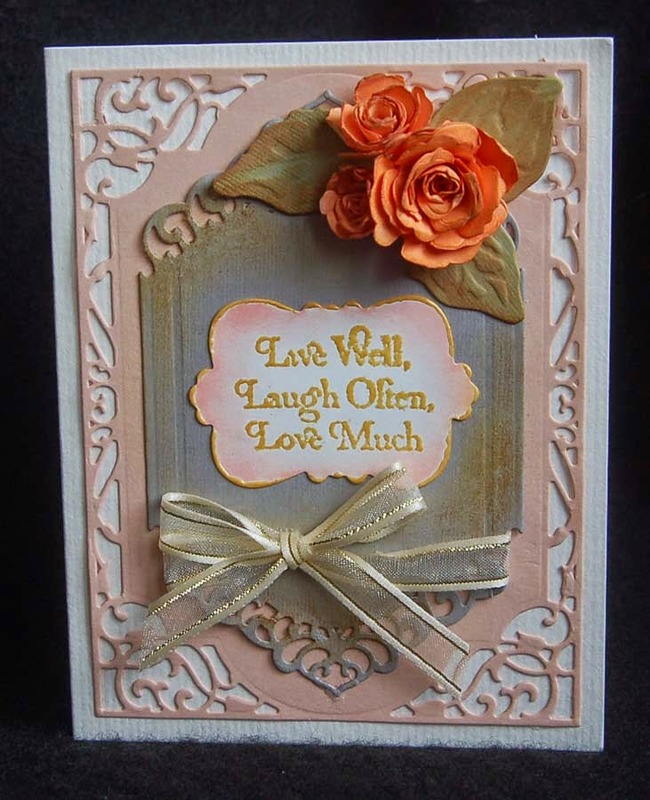 The Spellbinders Fantastic Flourish die cuts really delicate foliage but the intricate design requires repeated passes through the die cutting machine to get a complete cut. The purple tag base was cut from a textured cardstock which I think really matches the gauze cardstock. I also liked the effect of the yellow green shimmer cardstock tag base because the shimmer is so subtle and soft. 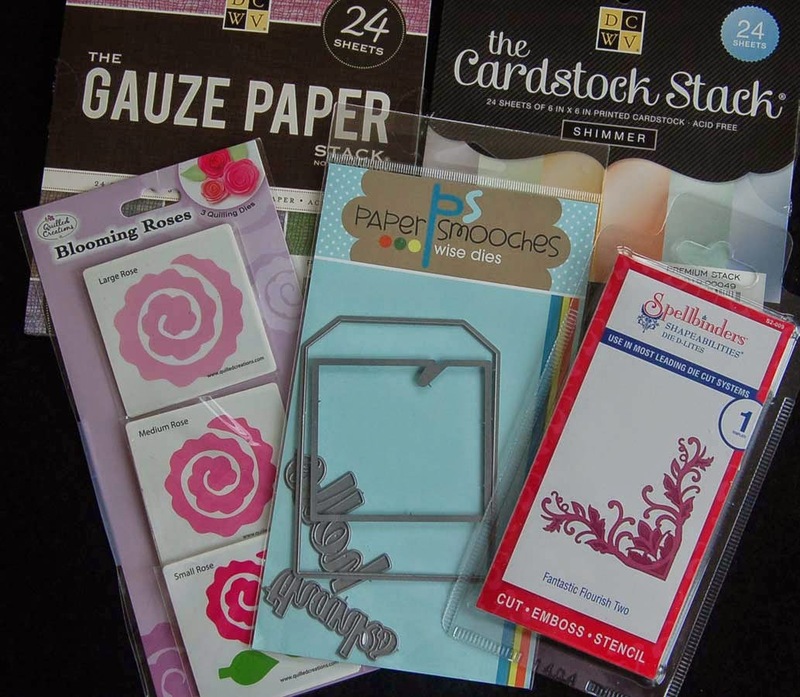 These tags were a great way to test out and learn what works best with these dies and papers. I hope that you will spend some time checking out the new products being sold at HM Ben Franklin Crafts because I know that crafting can make your day (and life) a better one. To test out one of my new dies, I grabbed the backside of the tea pouch ( I used the front to make my cat condolence card that was posted previously) and ran it through my machine. It took a few passes before I got a clean cut, perhaps because the die is so intricate. Does anyone else have that problem with very fancy dies? Any technique tricks? The resulting test cut was so pretty I decided to make it into a card. 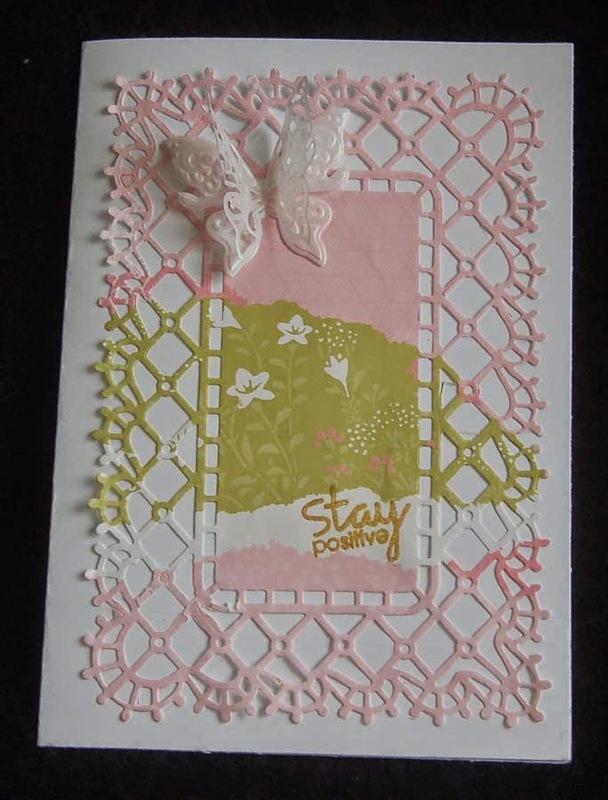 At first I was going to put die cut butterflies and flowers, but I decided to simplify my normally 'more is better' style because the doily die is so fancy. 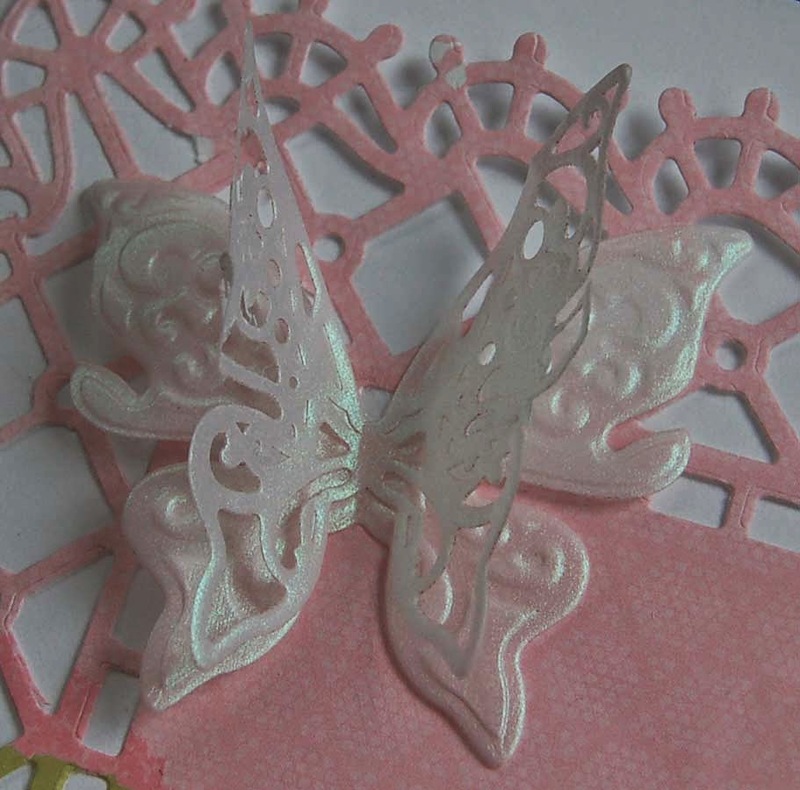 I chose to cut a butterfly from iridescent vellum using the smaller die from the Spellbinder set. The back wings were cut with the other die that cuts and embosses. I think the two pieces together make a gorgeous butterfly. The set has a two piece larger butterfly too. For the sentiment I used a stamp from a Paper Smooches set. I stamped it in gold ink and heat embossed it with gold powder. I wish the Sizzix doily die was a bit smaller because the card had to be 5x7 to accommodate it, but it is so pretty I still think it is worth getting (purchased from HM Ben Franklin Crafts). When I first saw the butterfly dies I thought that they were too intricate and I knew that I would have some cutting problems, however they turned out so beautifully I don't mind the extra work it takes to get a clean cut. In the end, I was glad I kept the card simple because the lovely die cuts can be appreciated more. 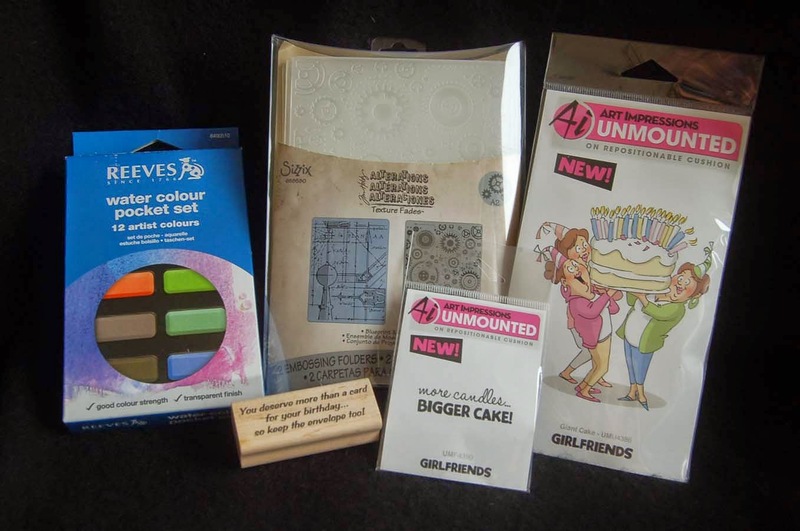 I hope you'll visit Ben Franklin Crafts to see what new dies are now available to make your paper crafting more exciting. Thanks for visiting this blog site and please leave a comment if you have some time to spare. Shaved Ice Tags and Contest Winner! When I make cards I usually stamp two or three of each image I plan to use. Almost always there are a few coloring mistakes or images that are not 'perfect'(actually no images are truly perfect.....right?perfectionist?). Anyway, rather than throwing away the 'extras' I either pop them into the stamp packaging for later use or if I have extra card stock I fashion them into tags. 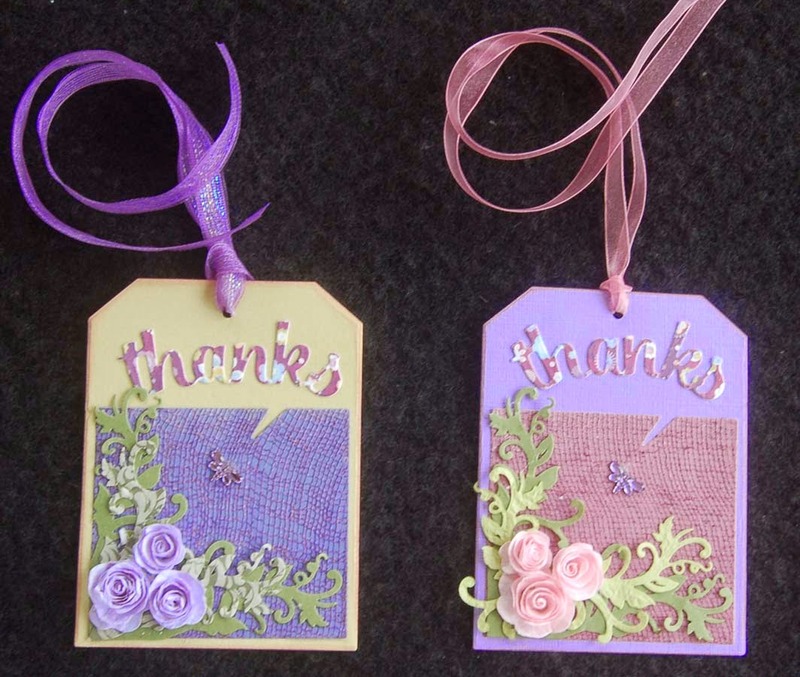 For these tags I used a Paper Smooches tag die (from the set that is called quotable tag) and punched a hanging hole. I particularly love the Heiko rainbow ribbon I found because it matches so well with the shaved ice. 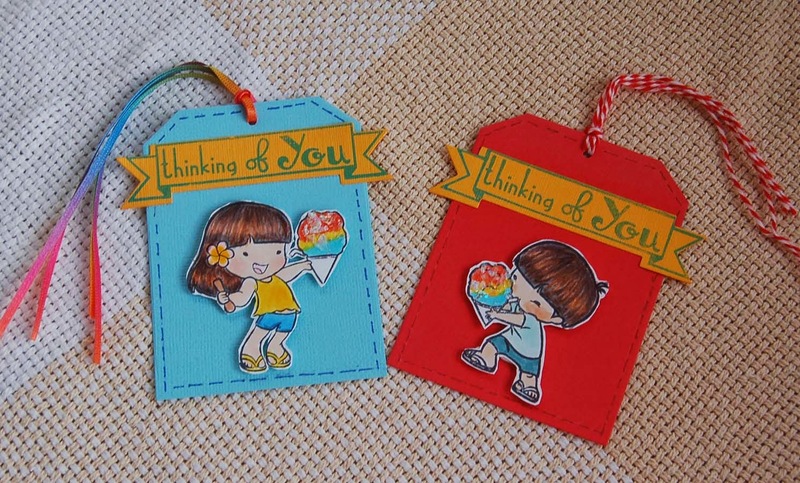 I added the 'Thinking of You' banner (had extras) to balance off the tag design and because that keeps the tag usable for tying on to any small gift. Making tags is a good way to use up the 'extras' but also can be a good way to practice (and test out stuff like glue and glitter) before actually making a card. I am happy to have two more tags to add to my stash and to have used up the 'extras' so they didn't become more additions to my scrap pile....no need for that....right? 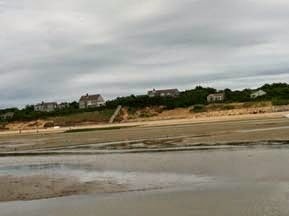 Yes, NIki Garcia is the detective who figured out that the photos in the previous post were taken at Cape Cod and the reason we were there was to go clamming. 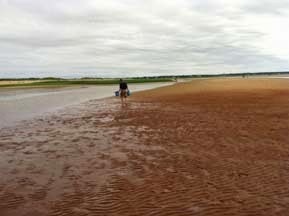 These are the kinds of clams we were able to dig up. The skinny ones are called razor clams and despite their appearance are really delicious. 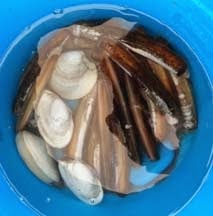 There is a reason they are called razor clams; they can easily cut you as they try to escape your grasp. They are REALLY fast! Thank you to everyone who played my little guessing game. Keep reading this blog for future contests; you might be the next winner! I've been traveling and only reading blogs from my phone. As my way of apologizing for my lack of comments on your wonderful posts, I've decided to make a contest (with prizes). The first person to identify the general area where this photo was taken and figure out what I was doing there will win some craft goodies. Also for those of you who commented on my posts in the month of July, I am doing a drawing. This time the lucky winner of a $25 gift card to HM Ben Franklin Crafts is.........Eva, who writes the blog, crafting this and that. Congrats Eva! Please send your mailing address to (lsakami@aol.com) so I can send you the HM Ben Franklin Crafts $25 gift card. Thank you everyone for being a loyal readers of my blog and leaving a multitude of ego-boosting comments.